Now that I have accepted my geekiness, I realize that I’m also proud of it. This is new to me. I’ll use this blog space to show off my love of DNA, genetics and just cool facts. I’m also hoping to do some cool projects like science cookies or a DNA scarf or ??? Do you call yourself a geek? I will often self-identify as a geek at my office job and people get concerned that I’m putting myself down – but I’m not. 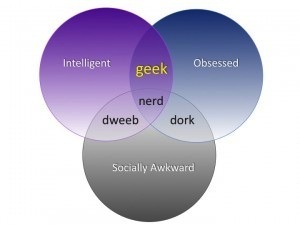 One thing that does bother me if when someone confuses these terms: geek, nerd, dork, etc. I have a handy venn diagram to help you see the differences. So are you a geek? Are you proud of it? I have put this diagram on a travel coffee mug and it starts some good discussions! Note: I’m a geek but that doesn’t make me smarter than anyone else. Some of the smartest people I know had trouble in school. When I was in grad school, I had a ten step process for the question ‘what do you do?’. It started with ‘I’m a student’ and moved into the final description of my project: I study how genes stay off. Often, it was just easier to say that I worked as a cashier at London Drugs because I used to hate the reaction of ‘wow, you’re so smart’. If that silly reaction happens now, I just respond with a ‘no, just wanted to avoid real life for a bit’. No more fake jobs for me. Ha ha, brilliant. I’ve always wanted/needed someone to clear up those differences. Love the diagram–too funny. It is only natural that a geek would graph things out. Technical thing, can you put the Flattr logo beside the Tweet logo, this would look less cluttered ? That would look better. I don’t know how to do that = it’s beyond the limits of my technical ability. Greetings. Looking forward to your new posts. Stylish diagram; have you seen http://xkcd.com/747/ ? Quietly– I’m quietly a bit geekish.. The Venn diagram is nice.. May I contact you later about using it on my [in development] site? 🙂 -ta! I do love the Evolution of a Geek comic – thanks for including the link.